I love tinkering and building things, especially after work. This means working indoors, and good light makes for an enjoyable, productive and safe workplace. Usually it is better to have multiple sources leading to less shadows but sometimes you need one very strong light source. Just like for bulbs that are too small, finding efficient replacement for bulbs that are too large can be hard. Fortunately I found this CFL bulb by Ecosmart that for 68 Watts generates more light than a regular 300 W fixture. 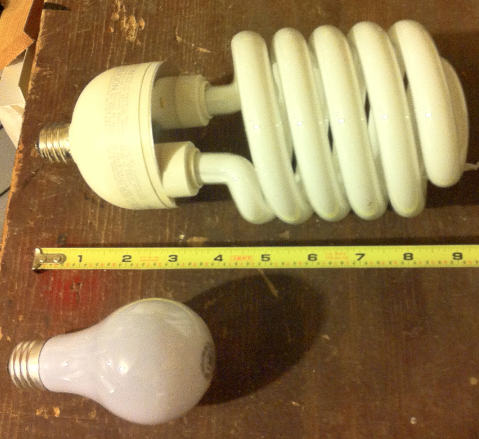 The bulb is quite big – almost comically big – as compared to a regular bulb, as you can see in the picture below. Make sure you are planning to put it in a fixture that will fit it!. But it gets the job done and I can use it for a handful of hours without blowing my daily energy budget. Of course, as with any CFL, one has to be very careful not to break them and to recycle them appropriately because of their Mercury content. I would love to hear stories of others making their work lights more efficient. I have seen, but haven’t tried these other work lights which are LED based but because of the cost and form factor – I just needed something to put in a bulb socket.